Manages the configurations defined for the project. Select a button to add, rename, remove configuration or set it active. Displays the list of defined configurations for the given project. 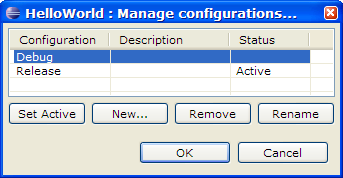 Displays the new configuration dialog that can be used to create a new configuration. Removes the selected configuration from the list, prompts the user to confirm the action. Displays the rename configuration dialog that can be used to rename the configuration name & description.